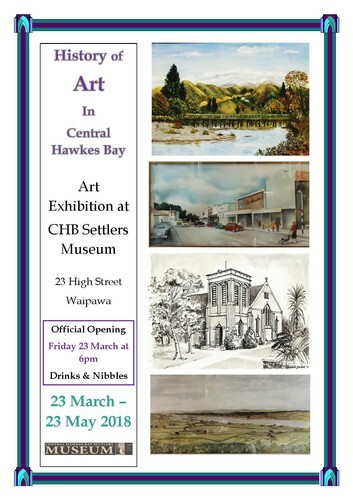 The Central Hawkes Bay Settlers Museum is opening an Exhibition “The History of Art in Central Hawke's Bay” at 6pm on Friday, 23rd March. The aim of the Exhibition is to demonstrate that the Arts, in particular painting has been active in Central Hawke's Bay since the time of earliest settlement through to the present day. The period during the late 1960’s and early 1970’s saw the formation of the various local Arts Groups and emergence of prominent CHB artists such as Richard Moorehead, Gary Waldrom and Pauline O’Sullivan, artists whose works have been hung and exhibited in major New Zealand Galleries. This will be an interesting Exhibition, with examples of some of the more historic paintings relating to Central Hawke's Bay shown and up to and including examples of contemporary modern art. The Exhibition will demonstrate different concepts such as mural and street art and the diverse themes that were evolved through such events as the Norsewear Art Awards and of course, the annual/bi-annual exhibitions that are still held by the various Central Hawkes Bay Art Groups. The Exhibition Opening will be held on Friday 23rd March at 6pm and the Exhibition will run until Friday 25th May.